Does this release supersede the 2.0.4.7 release posted just before? Also, any plans to fix the issue with the “check for updates” functionality? I wanted to translate the new functions on viewing the logs, where can I go to translate into Italian? Ignore 2.0.4.7, I forgot to git pull so it is identical to 2.0.4.6. Can you reload the page? The options are loaded from the server, so I think there might be a glitch where the options are empty. Also if it helps I downgraded to 2.0.4.2 and 2.0.4.4 and for both the update checks instantly started working again, so the issue appears tied to something in the 2.0.4.5 release, not some change on the updates server or DNS. alt.updates.duplicati.com indeed doesn’t resolve. updates.duplicati.com resolves to 139.59.135.67. Did Duplicati 2.0.4.4 and later change the update server URL to alt.updates.duplicati.com? In that case, the solution could be adding an A record alt.updates.duplicati.com in DNS that points to 139.59.135.67. Yeah, I assume @kenkendk’s comment here that it was “not a problem” meant that the alt.updates.duplicati.com error was EXPECTED. Yeah, you cannot do that. The server relies on SNI to pick the right certificate. If you send a name that it does not know, you get something like “upstream server error” as there is no server that handles the name. Does it also fail with 2.0.4.6 upgrade to 2.0.4.8 ? Otherwise, I will try to install 2.0.4.5 on a clean system and debug the update problem. 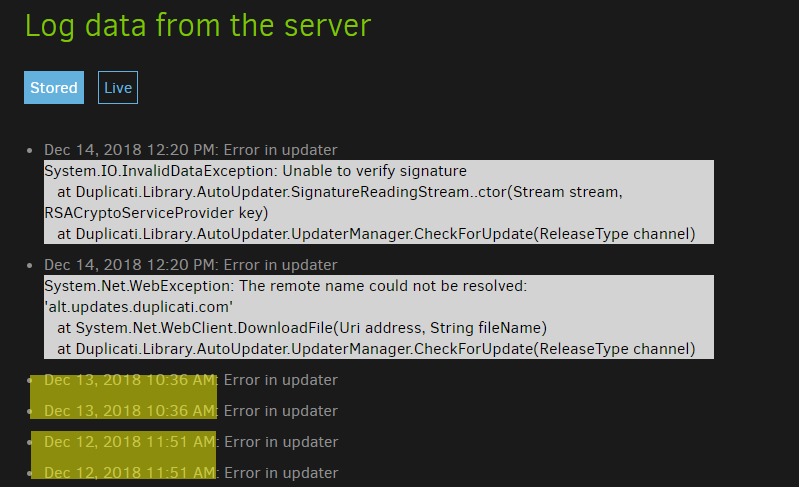 From the error message, it sounds like 2.0.4.5 is using the wrong key to validate the signature in the update package. For me, yes - and I think my previous comment about 2.0.4.2 and 2.0.4.4 updates working may have been incorrect. I think they were reporting an already detected update after their individual checks failed. Keeping in mind I do weird things to my installations, I did some tests and it appears I now get the error on ALL versions as far back as at least 2.0.4.2 exp (my base install). 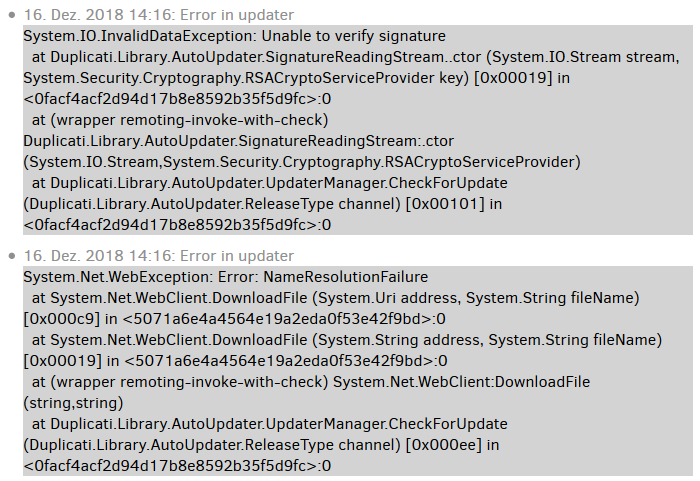 Why aren’t these errors showing up in the GUI alerts? Hi tigro11, follow the directions of capilano, so you give me a hand in the translation. The NameResolutionFailure may have been resolved - please try your update again. Arh! That got me on track! It is a problem with the mirror. It detects a new version and downloads that, but overwrites the old file without truncating it first. Normally that is not a problem because the manifest file grows in size. But I recently removed a bunch of old release notes, so the new file is smaller, causing the downloaded file to contain junk at the end. I have fixed the mirror server and now it serves the correct file. Indeed, updating from 2.0.4.4 canary to the latest version just worked.